Episode six blew our minds! Virgin energy, Lightwood family dramz, and a good deal of history: here's your recap to remind you of everything that happened! 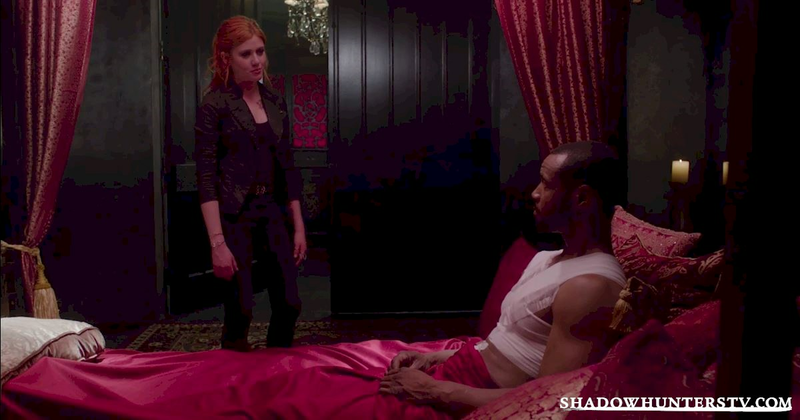 Clary and Simon arrive at Magnus’ lair carrying Luke, who is badly injured from his fight with the alpha werewolf. 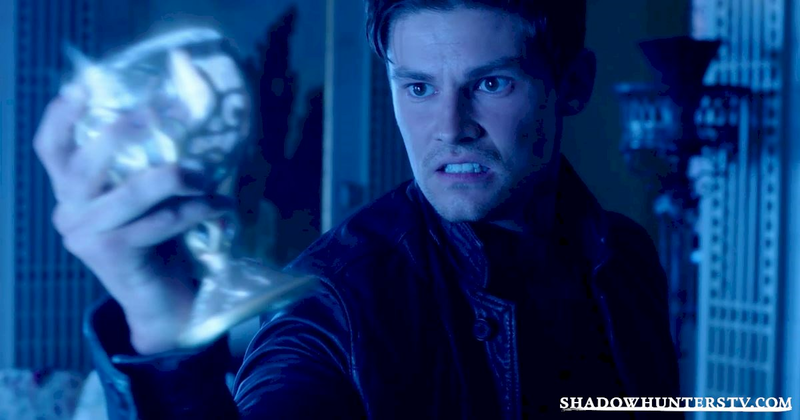 Disorientated, Luke has a vision where Jocelyn tells him that he must help Clary find the Mortal Cup. Magnus explains that Luke was poisoned by the Alpha bite and needs an antidote. And apparently, Alec’s "virgin Shadowhunter energy" is essential to the process. Who knew? 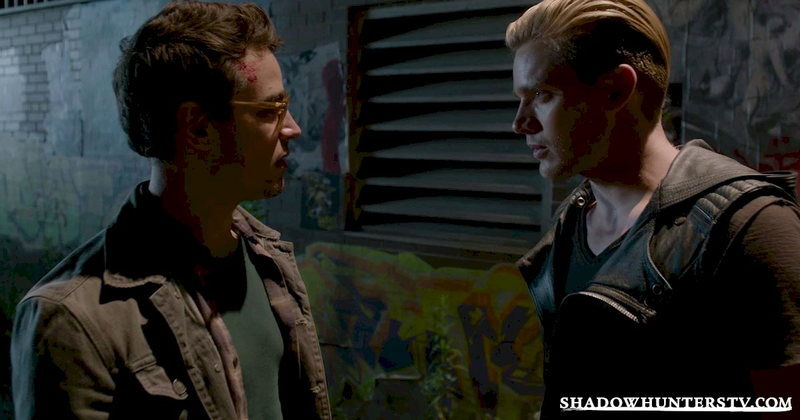 Once Simon has finished being worryingly interested in the blood coating his hand, he and Jace head out to find the other ingredients they need to save Luke. 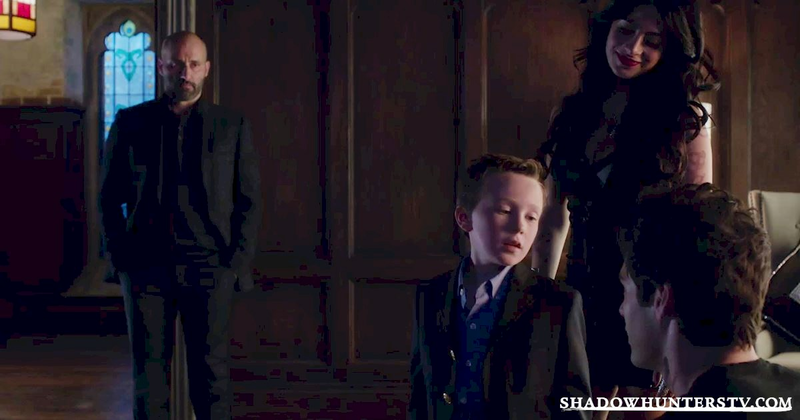 Robert Lightwood returns to the Institute with Alec and Izzy's little brother Max who has just been sent home from the Mumbai Institute for starting a fire during rune studies. Robert is furious that Clary isn’t under the guard of the Institute and insists that she return immediately. Alec calls Jace to tell him to come back to the Institute, but before he has a chance, Jace jumps in and explains that Magnus needs his help to heal Luke. Whilst hunting down all of the weird and wonderful ingredients for Magnus' magical healing potion, things get a bit heated between our love rivals when Jace makes the mistake of calling Simon a mundane. Again. But this time, our favorite mundie fights back. 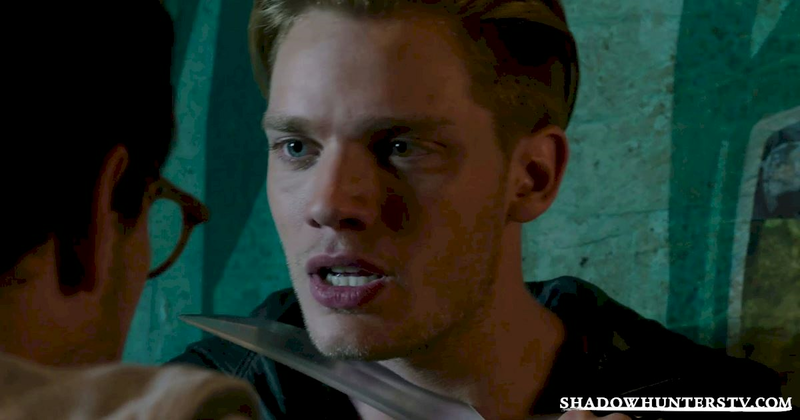 Simon loses it and pulls a dagger on an unsuspecting Jace. Suspicious about Simon’s new found feisty side, Jace asks what happened to him at Hotel DuMort, and Simon shrugs off the question. 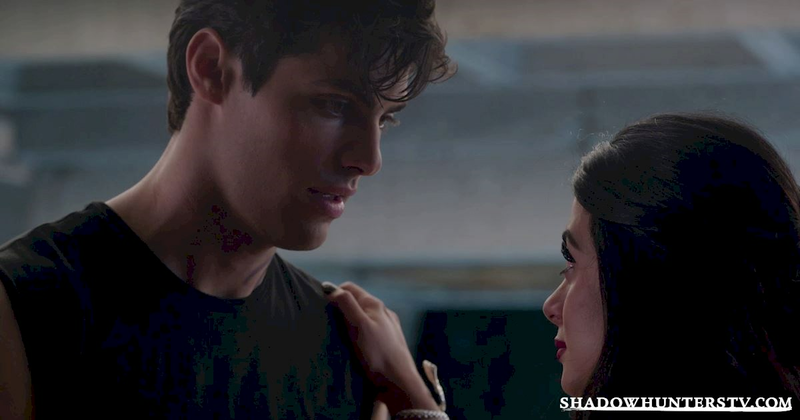 Back at the Institute, Alec and Maryse have a heart to heart. 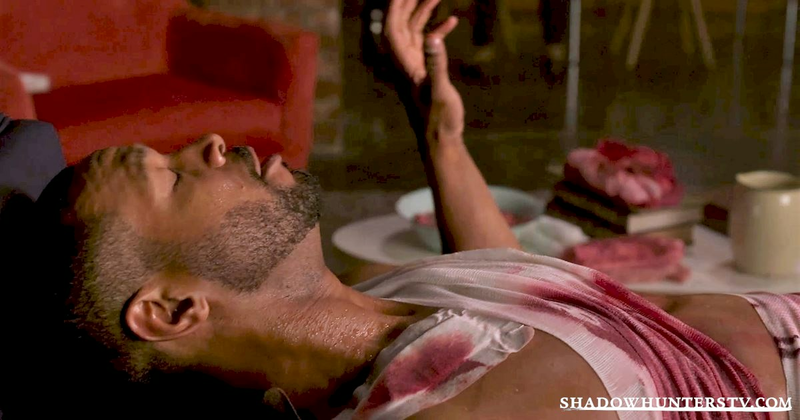 While watching over Luke, Magnus tells Clary about her mother’s relationship with Valentine. He says that one night many years ago, Jocelyn found Valentine covered in Warlock blood after he had attacked them. He explains that Valentine had become obsessed with ensuring purity of blood as he felt impurities were a threat to peace. Robert gives Izzy a cookbook from Idris before explaining that if the Seelies stop being allies to Shadowhunters, Valentine may actually win the war. Robert says he is concerned that the family name has been tainted because of the sibling's unsanctioned missions with Clary. Isabelle promises that she will make things right but Robert warns that it will take a huge sacrifice. Magnus tells Clary that Valentine started the Circle Uprising 19 years ago. He explains that his goal had been to abolish the Clave’s power, steal the Mortal Cup and destroy the Accords. He explains that Luke and Jocelyn stood up to Valentine when they saw just how dangerous he'd become. Meanwhile, Luke's illness worsens. 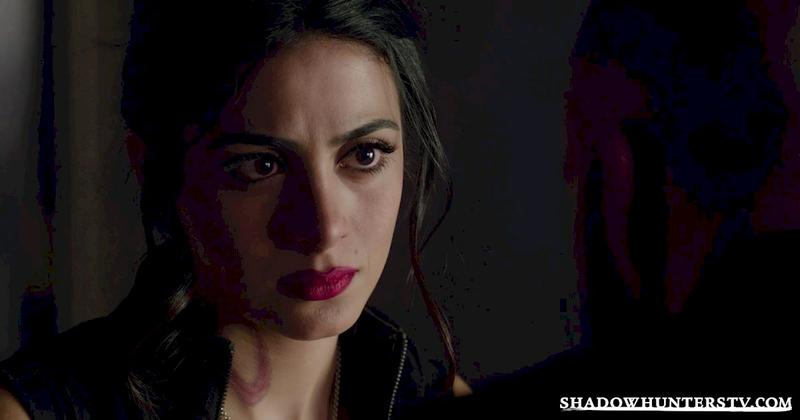 Izzy tells Alec that their parents intend to marry him off to create a political alliance and that she has been asked to talk the Seelies into reinstating their alliance with the Shadowhunters. Understandably, Alec becomes angry and blames Clary for all of their problems. 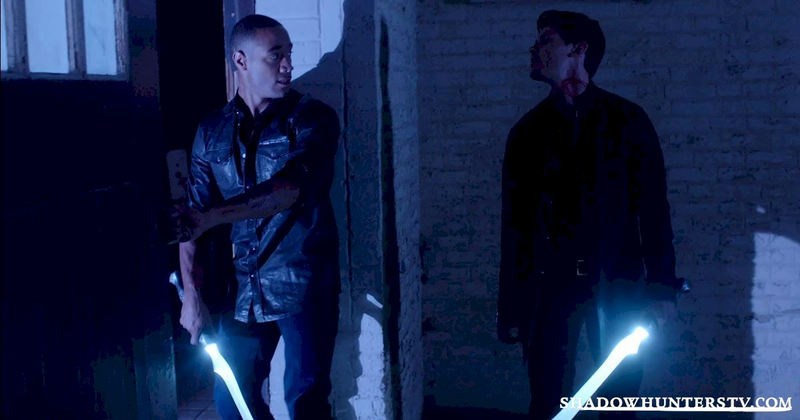 Jace disappears to find a specific ingredient for Luke's antidote, leaving Simon alone. In the shadows, he sees a figure who looks like Camille Belcourt. Simon is drawn to her but once he gets close, he sees a lifeless image of himself, two teeth marks visible on his neck. 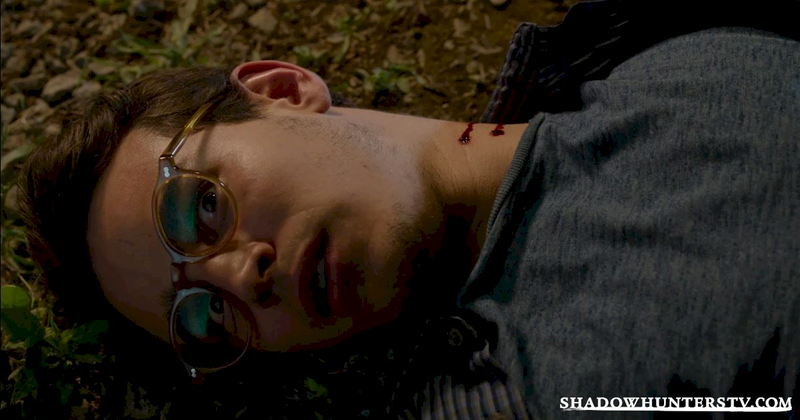 Simon is seriously freaking out when Jace reappears closely followed by a demon. The two don't hang around and instantly make a run for it! Magnus' magic is seriously waning as he struggles to keep Luke alive but just in time Alec arrives to offer a helping hand. Literally. Throw some major Malec feels (and embarrassing notions of "Virgin Energy") in the mix and we have one of our favorite scenes of the series so far! 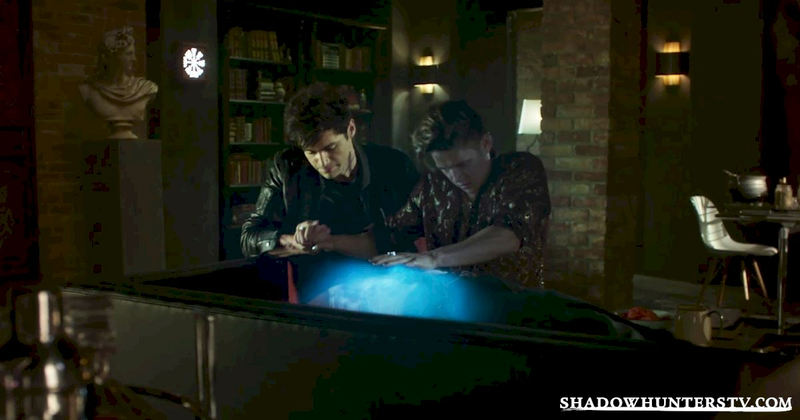 Not a second too soon, Jace and Simon return to Magnus' apartment with the last of the potion ingredients. Clary rushes to finish the antidote and gently pours it in to Luke's mouth. The pain eases instantly and slowly he comes around. Clary takes Jace aside and thanks him for helping to find the ingredients for Luke’s antidote. There's one super cute lingering look and just as it looks like something might happen between them, Simon walks in. He explains Luke is asking for her and Clary and Jace spring away from each other. Realizing what he just interrupted, a heartbroken Simon heads off in to the night. Isabelle puts her teaching skills to the test and quizzes Max on how well he knows his runes. A stern looking Maryse walks in and tells Isabelle how hard it is being the commander of her children. She explains that she worries Isabelle's passion could get her in to lots of trouble one day. During a conversation with a slowly recovering Luke, Clary discovers that Luke and Valentine were Parabatai but that their bond was weakened when he fell in love with Jocelyn. Clary learns that Valentine had started experimenting with Downworlder blood in the hopes of using it to become stronger and more powerful. He planned to defeat the Clave and use the Mortal Cup to create an army of Shadowhunters. 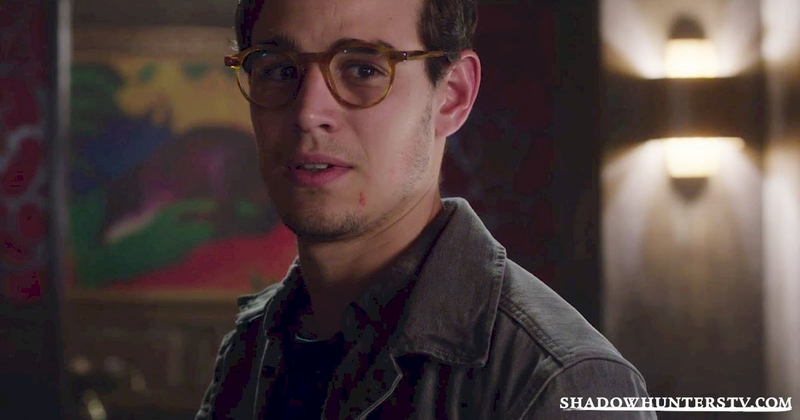 Luke explains to Clary that Valentine had asked him to help out with a mission where werewolves were being blamed for the disappearance of some local farmers. When Luke enters a building to check out the area, Valentine sealed the door and left him to be attacked. Alec and Magnus share a drink while the temporarily coy warlock tells Alec he has feelings for him. 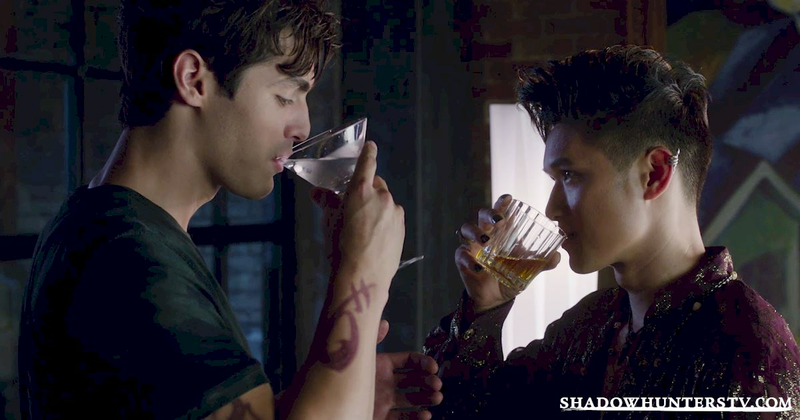 Alec is clearly torn between listening to his head or to his heart, not helped by a call from his mother interrupting the moment but somehow Magnus still convinces him to stay for one more drink. 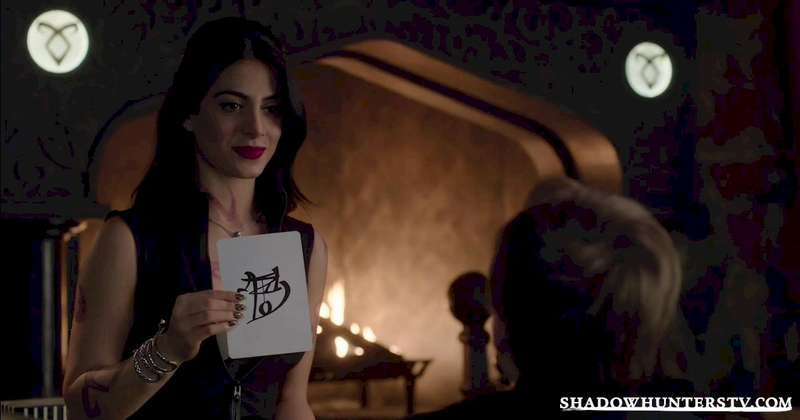 Meanwhile, back at the Institute, Izzy writes a fire message to Meliorn explaining that she can’t see him any more after a fight with her mom. 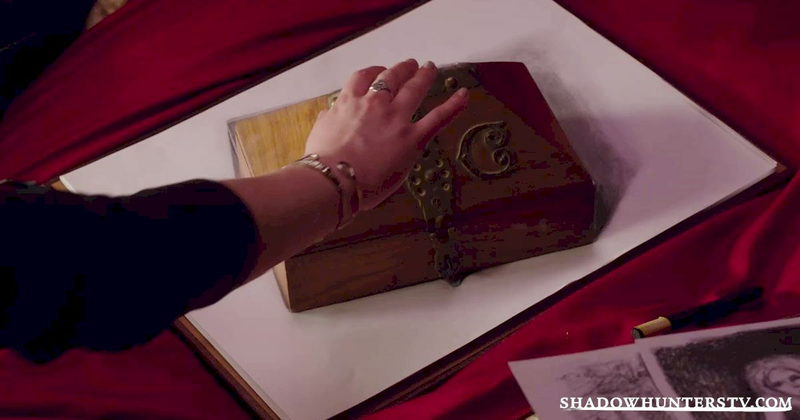 Luke tells Clary that the wooden box she found with the initials JC belonged to her brother: Jonathan Christopher. Jonathan was killed by a fire set by Valentine at Fairchild Manor. 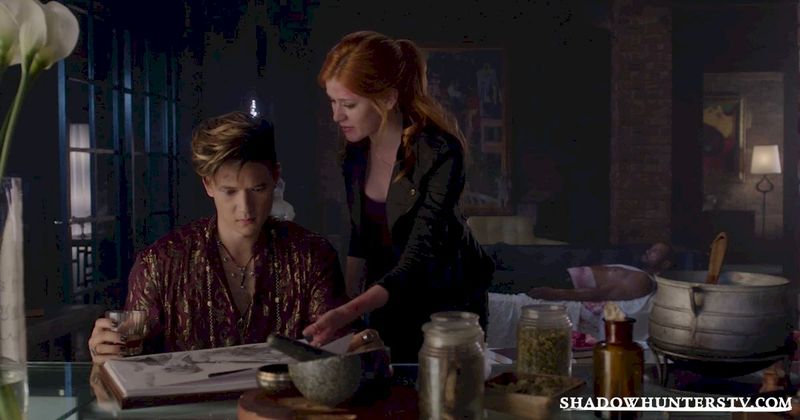 The wooden box falls into a page of Clary’s sketchbook and becomes a drawing and Clary realizes she thinks she knows where her mom hid the Mortal Cup.